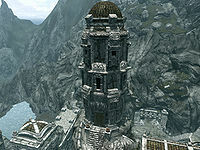 The Guard Tower is a Dwemer tower in the center of Markarth. The Guard Tower is reached by climbing a flight of stairs to the north of Ghorza gra-Bagol's shop and forge and then turn to the east and keep climbing, passing the alley that leads to the Shrine of Talos all the way to the top. Entry is made at the top of the tower, with a flight of stone spiral stairs leading down inside to a Dwemer style corridor with two large rooms used as dormitories and a circular martial skills practice room. The Dormitories are on either side of the central corridor, with two doorways into each, at the far end of the corridor is the circular practice room. The dormitory to the south contains five owned single stone beds, three along the south wall, with one coming out from the east and west walls. Against the north wall between the two doorways is a stone table with steel sword, a steel helmet, a potion of healing and two bottles of Nord mead on top. In the southwestern corner is a square wooden table with a mead barrel, a pair of iron gauntlets, a sliced goat cheese and two loaves of bread on top, while in the northwestern corner is a food barrel with a set of steel armor on top. The second dormitory is almost a mirror image of the first room with five owned single stone beds, three along the north wall, with one coming out from the east and west walls. Against the south wall between the two doorways is a stone table with a copy of the One-handed skill book The Importance of Where, a set of steel armor, a steel shield, a steel dagger, a red apple and a loaf of bread on top. There is a bucket containing five red and one green apple on the floor beside the table. In the southwestern corner on a crate is a cast iron pot containing a rock warbler egg and a couple of pieces of cheese. On the other side of the bed is a food barrel. In the northeastern corner of the room is a square wooden table with a copy of the Light Armor skill book Ice and Chitin, a leather strip and two loaves of bread, while in the southeast corner is another food barrel with a knapsack on top and a steel greatsword leaning against it. Along the corridor are four stone benches, four barrels containing foodstuffs and next to one of them is a basket containing a couple of cabbages and several potatoes. There is also a random eidar cheese wedge in the middle of the corridor, level with the second pair of doorways. The practice room contains three melee dummies, an archery dummy and an archery target. There are also four stone shelves built into the walls, they hold a steel battleaxe, two steel maces, a pair of steel Nordic gauntlets, a steel sword, a steel helmet and a steel shield. You can freely enter the tower and rooms below without it being classed as trespassing, also as the guards are all asleep, unless it is during the change of the watch you can take whatever you want and practice your pickpocketing skills. This page was last modified on 25 November 2017, at 03:08.